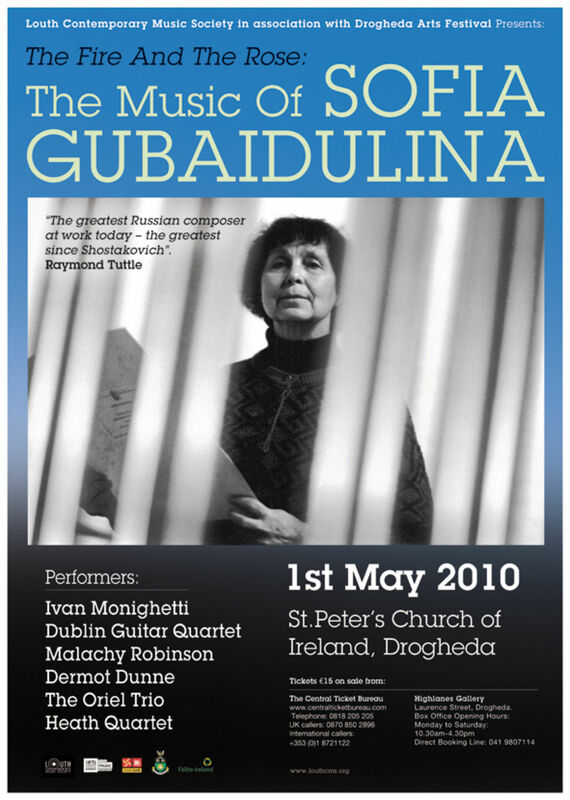 A Portrait Concert for Sofia Gubaidulina will be held on 1 May 2010 in Drogheda, Ireland, organised by the Louth Contemporary Music Society in cooperation with the Drogheda Arts Festival. The interpreters are: Ivan Monighetti (violoncello), Dermot Dunne (bayan), the Oriel Trio, the Heath Quartet, the Dublin Guitar Quartet and Malachy Robinson (double bass). This portrait concert will be preceded by a presentation of the 1989 BBC film “The Fire and the Rose – The Music of Sofia Gubaidulina” made by Gerald McBurney. In connection with this Gubaidulina Portrait, the “Repentance” interpreters will record this ensemble work in Drogheda for a CD which is planned to be issued on the occasion of the composer’s 80th birthday.